Big BIG FINISH Week: Doctor Who - THE HARVEST Review | Warped Factor - Words in the Key of Geek. The Harvest is the third of three experimental stories from Big Finish, for which the brief appears to have been pretty exciting from the word go: do something new with companions and Cybermen. The Fifth Doctor Cyber-story, The Gathering, takes Davison’s Doctor back to Earth to find Tegan, decades after she left him, her life quite small and unsatisfying, and very nearly over. It’s a story that doesn’t let the Fifth Doctor off any of the hooks Tegan caught him on, and refuses absolutely to give him any easy, time-travelling way to solve Tegan’s problems: perhaps uniquely, it’s an audio that if anything hardens the sentiments of a companion towards their Doctor (at the time it was the first – and was presumed also to be last – audio story Janet Fielding would do for the company, so it could afford to feel final). It tells the somewhat low key story of a piece of relatively unimpressive Cyber-technology, and how it can still have important consequences for Tegan’s life. The Reaping, the Sixth Doctor’s entry into the loose trilogy, finally takes Peri home to deal with the fallout of her reckless decision to run off into time and space – to face her family’s disapproval, their heartache, their hurt feelings. Where Tegan hardens her attitudes towards the Doctor, Peri discovers how time and space have changed her, giving her the resources to stand up for herself and her actions, while still being compassionate to those she loves. If Tegan’s story is an ending, Peri’s is almost a rebirth, set against a much more full-on Cyber-story – think town under siege, weaponising the dead, uber-future Cybermen and a race against time before the Cyber-threat goes critical. 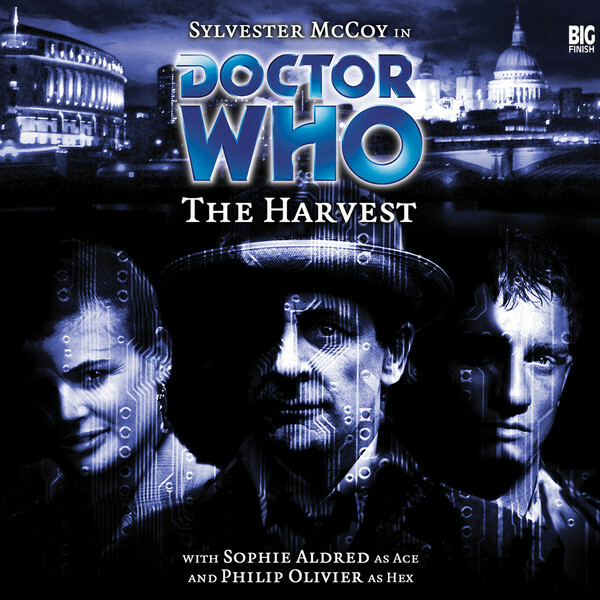 In contrast, The Harvest, the Seventh Doctor story, does something relatively straightforward in terms of companions – it starts the journey of one: staff nurse Thomas Hector Schofield, known to his friends as Hex, gets involved in the life of the Doctor and Ace, going by her surname of McShane at the time, when strange and creepy things start happening at his place of work, St Gart’s hospital, London. If the companion journey in this story is comparatively straightforward, the Cyber-story is probably the most breathtaking of the three by virtue of its potential. Dan Abnett takes a fresh look at the Cybermen and asks one fundamental question: what would happen if the Cybermen decided they didn’t want to be Cybermen any more? It’s a question that entails the reversal of much of their traditional body horror, but it also puts us more viscerally in touch with that horror than we usually get, as what we’re dealing with here are Cybermen intent on replenishing themselves with flesh, blood, sinew, and an emotional cortex of responses. The Cybermen have always had the essence of bodysnatchers, but seldom more potently than here, as nano-surgeons at St Gart’s try to find appropriate tissue to make this gothic nightmare come to pass. Incidentally, if you thought the plot of Deep Breath was original, you’re about ten years too late – The Harvest was released in 2004, and basically lays the pathway down which Deep Breath would eventually tread, machine creatures adding flesh to their frames in an attempt to become more and more human. Of course there’s more to it than that – there’s a cogent, if depressing, commentary on human greed and the ever-present need of nations to get ahead of other nations any way they can, and there are twists which even having come so far it would be unfair to spoil for you. But The Harvest also seeds a couple of New Who Dalek stories of which neither Abnett nor Big Finish could have had any idea when it was released. If Evolution of the Daleks proposed the unlikely scenario that the last Daleks in existence could feel jealousy for human beings and want to emulate them, the leap is easier to make in terms of the Cybermen here, because they aim to operate from a position of logic, and logic dictates that the people of Mondas responded to extraordinary pressures, but in the absence of those pressures, the need to be in Cyber-form should be re-assessed. In essence, the idea of Cybermen who change their mind is shocking, but rational (rather than having to be explained away as a mechanical fault, as in the case of Rusty, the humanist Dalek from Into The Dalek). There’s also a sense of similarity between The Harvest and The Wizard’s Apprentice/The Witch’s Familiar, with the idea of a desperate, aching closeness to something wonderful, a détente between the Doctor and one of his oldest enemies, only to have that potential snatched away close to the end. Make no mistake about it, The Harvest is a suitably emotional ride, given the subject matter. It also shows Ace and the Doctor as having come a long, long way together, able to trust each other implicitly. It’s an evolved Ace from her on-screen days, a relatively grown-up Ace after the events of audios like Colditz and The Rapture, which saw her ditch her nickname and reclaim the surname from which she’s always been hiding. In terms of its dynamic, it’s an example of something that has been done successfully since on audio, and taken rather more as a stimulus for comedy episodes on-screen too – the idea of the Doctor going long-term undercover in an environment to assess some alien chicanery and put a stop to it. Back in 2004 though, this was still an unusual idea – that the Doctor would take the time to blend in with human beings, rather than forcing events to go his way with his usual mystique and button-pushing. It’s a scenario that brings a sophistication of performance out of McCoy and Aldred that makes for easy listening despite the high-octane emotional loading and the gothic concepts at work within the story. And what of Hex, the new boy? Philip Olivier, then best known for his work on the soap opera Brookside, delivers characterisation by the bucketful. Abnett’s script allows him a proper journey (most akin, in TV terms, to that of Donna Noble, going from ‘What the hell, this makes no sense!’ through his deep compassion and ability to rapidly process the bizarre realities of this life of Ace’s and the Doctor’s, and decide he wants to be part of it). Late in the story, he’s throwing his knowledge as a nurse into the fray, helping save people from death and harm as the body count rises, and able to take command of situations when needed, even when faced with rigid authority structures which see him as little more than the lowest life on the ladder. The Harvest gives Hex a rollercoaster of an introductory story (it’s not really an origin story – we learn much more of his origins as he goes along), showing him as having the right stuff to join the Tardis. It also delivers a Cyber-story that to this day is unlike anything that’s been tried since, for all its uniqueness rather dissolves towards the end. It gives us a timely lesson in the susceptibility of humans to greed and self-interest, even at the expense of the lives of the little people, and it stands as the most linear and satisfying of the three stories in a very unusual and dynamic trilogy. If you haven’t tried these stories yet, give them a go – and in particular, invest in The Harvest. Not only does it begin a whole new series of adventures for the Seventh Doctor – the Hex stories – that include many of the most inventive that Doctor has yet had, it’ll make you yearn for an on-screen Cyberman story that dares to flirt with this much invention, let alone this much heart.